We have been guiding clients in the Greater Cincinnati/Northern Kentucky region since 1973. Our extraordinary team is led by three managing members, David Anneken, Lisa Huey, and Kevin Moser. We are known for the caring service we bring to every client assignment, no matter what the size. 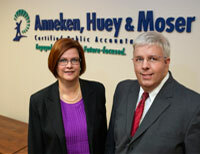 Anneken, Huey & Moser, PLLC is a member of the RAN ONE network, the world’s largest network of independent accounting firms. Our goal is to provide outstanding service and contribute to the success of our clients. In order to provide work-life balance for our team members, the office will close at Noon on Friday's for the months of June and July.